I have just started putting the Goliaths I got for Christmas together and I really like the way they are looking so far. They have the standard five minis per sprue of all necromunda gangs which has the unfortunate effect of there being fewer parts due to the larger build of the guys. You really do need to think about how you are putting them together so as to get the best weapon fit. For example, Juves, the apprentice gangers that are really useful have limits on what they can be equipped with. Pistols and hand weapons only with a 20 point limit for each weapon which means they need to have a Stub Pistol as it is the only pistol option that fits the criterior, and there is only one on a sprue so if you want the full allowance of two Juves then no one else can use one. There is no capability to change the pose of the body, like all the rest of the range, but with the Escher gang I have assembled the arms have a basically ball and socket fit so there is some degree of customisation, with the Goliaths the arms and bodies have a chevron type join so there is no way to change arm angles without some degree of fiddling about. Some I have put together as is but I am planning a couple of slight conversions which should look ok, particulary as there are some glue on shoulder armour pieces which should go some way to disguising any defects. 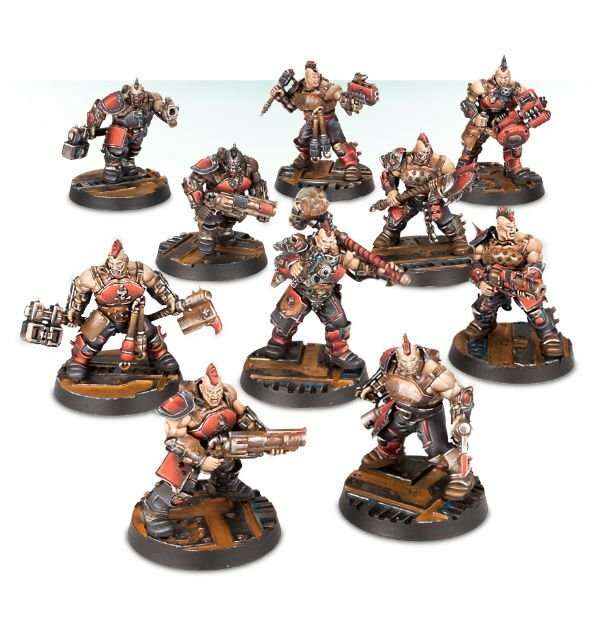 My first conversion will be the guy in the picture with the big hammer, he is the boss and is equipped for combat with a very nasty short range pistol and a hammer that should pretty much destroy anything it hits. He is the best fighter in the gang but he is too important to risk in combat unless I need to so I will try removing the hammer from his hand and relacing it with a scratchbuilt sword, also a grenade launcher which I plan on adjusting at the shoulder so it is in more of a firing positio than just carried facing down as intended. I will also green stuff a holster with a gun handle sticking out of it as a backup weapon in case I fail an ammo roll for his grenade launcher. I must say this all sounds pretty cool...I'd be curious to see a game play out someday. Next time I'm at Greenfield Games (my best FLGS available), I'll have to see if they play this. This is fast becoming a favourite game, I love the 40K fluff and the Necromunda part in particular. Some of the gangs are pretty similar to the original version but two are radically different, the Van Sars and the Delaques. I really like the new Delaques, the originals were Tele Savelas lookalikes, shaved heads, goggles and duster coats, fairly straightforward thugs. 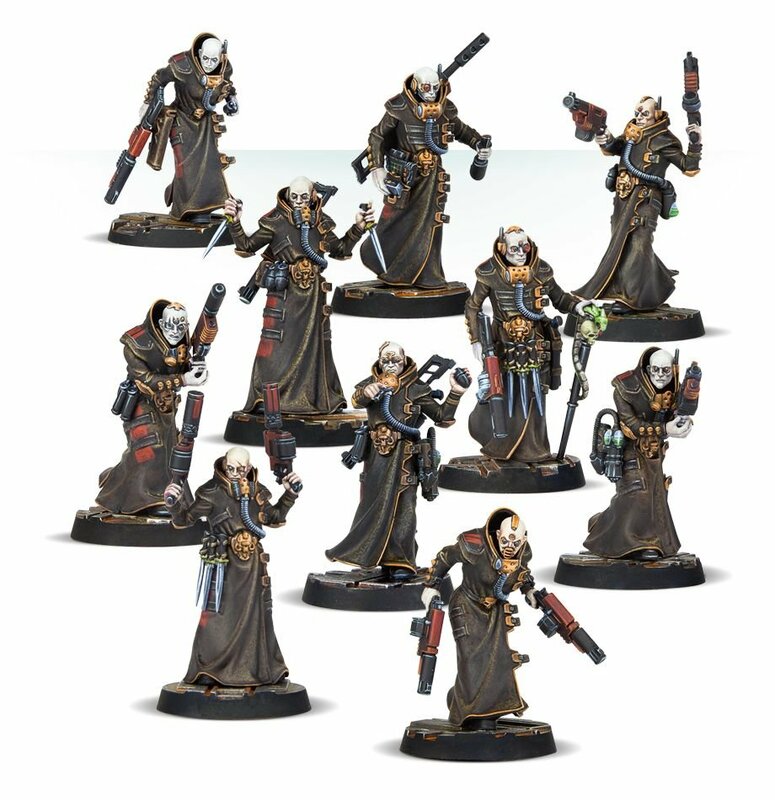 The new ones are sneaky spys and poisoners and they look really weird and screwed up. The game has an extremely detailed background built up over the last 30+ years, taken from many differing sources. Well damn, Frank! I was cruising Amazon, looking for inspiration for building some 28mm far-future industrial complex components... I'm stilled determines to get some DUST Warfare/Tactics gaming with these miniatures I've collected; not to mention ainting them, but I digress. Well damn, Frank!